When the Indian Space Research Organisation (ISRO) introduced the DY-100 space carrier in the late 1980’s it shocked the world. 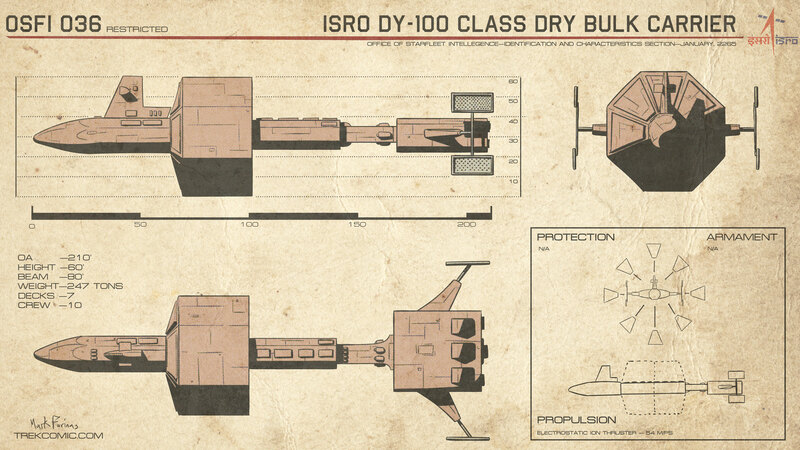 A symbol of the super-science being produced in southern Asia by the Singh regime, the DY-100 was now Earth’s most sophisticated (and only manned) interplanetary vehicle. With a cargo capacity many thousands of times that of the American STS or the Soviet Buran and capable reaching the moon in only two hours, it was hoped the DY-100 would kick-start a massive space mining industry. Unfortunately the series of conflicts that would later be called the “Eugenics Wars” halted their production and no further resources were available for an orbital support platform. Only three DY-100 carriers were ever built. After the war’s end the United States and the Soviet Union each commandeered a single DY-100 carrier. The third was never accounted for. Even with their captured units, the two superpowers were unable reverse engineer them for the several decades before the start of World War III. The lesser Mir and International Space Station facilities had to be retrofitted to dock and receive cargo from the more advanced ISRO ships. Mark, you should watch this if you haven’t already. That’s funny. Roddenberry would roll over in his grave at the mere suggestion that human technology was alien based. Wonderful read so far. Now we are getting into an area of Treknology that can be most-sensitive in many circles. An interesting take on things linking the DY’s to ISRO, but I and several others are curious as to how and why Khan and entourage would name the vessel after a location in Australia? I see also you intend to suggest that the Eugenics Wars and World War III were separate conflicts per the TNG canon references. Personally, I find that a little disappointing as Spock’s on-screen references to the mid-1990’s was fairly clear on the matter in my opinion. Nevertheless, I am anxious to see where this one leads. Hey, Jason. Love to get to have these conversations. Best part of having the comic. Spock gets the name of the Botany Bay straight off the ship’s hull, not the records. Kirk is surprised by the name saying “That was the name of a penal colony on shores of Australia, wasn’t it? If they took that name for their vessel…” Meaning whoever chose the name meant it as a historical reference to outlaws leaving to tame a new world. I doubt the ship was named before the Napoleons decided that it would be their escape route. Khan is definitely Indian and yet he’s well versed in Milton, etc. There’s no reason why he wouldn’t have come up that reference. I don’t think that the DY-100 could have been a Euro or NASA design since it would be impossible for Khan to just steal one. As for WWIII, Spock leaves some wiggle room there when he says it was the “era” for the third world war. I do yield to Encounter at Farpoint on this because it seems like the post atomic horror came much later in the 21st century and WWIII by its very nature would have to be a nuclear war. Considering this is a script by Gene and Dorothy Fontana it carries a lot of weight. Also, the US seems to be getting a lot of space exploration under its belt in this era, including the manned Saturn probe (on a captured DY-100 vehicle?) and the Charybdis (I know, not TOS) which tells me there is some early 21st C peace time. I also get a sense from TOS and early TNG that WWIII was a US/Soviet conflict. In TOS the USSR obviously never falls. Leningrad and Stalingrad are mentioned by Chekov in “I, Mudd” and “Tribbles” and maps in TVH. Chekov is raised in an odd, propagandist manner. TOS is also obsessed with letting us know that us 20th century people screwed the pooch really bad politically and socially and that it took that badness to get them to their 23rd century goodness. That tells me that whatever nuclear showdown Trek was concerned would happen from its 1960’s viewpoint did, in fact, happen. The Eugenics war does not seem to qualify as a nuclear war with only WWII levels of casualties (30 million). So in essence, Khan and company named the ship thus skirting manifest records for that period. I am quite certain this was the prevailing assumption in fandom but I thought it would be fair to ask for your confirmation. Now, it will be interesting to hear your ideas on how the DYs were developed. Classic Trek tech suggests that the DYs were developed around 1988. Until I read your take on things, I was under the opinion that these ships were developed as a part of an international coop declared sometime after the McKinley Rocket Base Incident (aka “Assignment: Earth”) as a part of a strengthened Outer Space Treaty – and an international effort to curb the weaponization of Earth orbit. I also envisioned that, perhaps during the EW, the production facilities for at least one of the DYs might have been occupied by Khan-allied forces. Then again, like the mainstream comic, it also makes sense that perhaps Khan and his ilk may have been partially responsible for the development of the tech involved. I will keep this short but I would love to discuss this with you at length. Continued success. I haven’t read Fanon material since the eighties and I was a kid and didn’t retain much of it. So I don’t know about the other fan theories concerning the DY-100. I figured that a world about to get into WWIII wasn’t going to be doing much international cooperation. The ISS is kind of a mess as it is in our relatively peaceful real world. I could have slapped NASA or Martin Marietta on the specs, but it just didn’t make sense that all this genetic breeding tech, beyond the scope of even the Nazis, was going on in South Asia throughout the 20th century and all these homo superiors were being created and no other technology was being produced. According to TMP the STS existed and was the best the US could still manage in this era. I couldn’t see the DY-100 as being a Western invention. Plus, I love going against Western Exceptionalism when I can. People don’t even realize there’s been an Indian space program since the sixties and they’re doing really interesting stuff right now. I’m glad to point some attention at them. The Eugenics Wars, imo, is THE most interesting bit of Star Trek future history. Suddenly, we have this huge leap in technological achievement after 1992 and we see Earth leap-frogging beyond the orbit of Saturn (by my reckoning 2020) followed by a period of global turmoil early in the twenty-first Century (via Colonel Green’s War) with another technological flowering between 2050 and 2065 with achievements of Zefram Cochrane. It would be interesting to see your take on the infrastructure needed for producing the DYs. The most pressing example is how to deal with the onscreen evidence for artificial gravity aboard Botany Bay. How do you reckon this came about and from what source? As far as Gene’s handling of the STS and related systems, I suspect that was more or less an attempt to keep Star Trek as “current contemporary” as possible; a subtle challenge that ballooned into a full-on continuity problem after 1987 and TNG’s premiere. It was only then that we learn of this “post-atomic horror” when it seemed (to me anyway) that Earth avoided this particular nasty bit according to TOS references (Per a few throw-away lines from “The Omega Glory”). Again though, I am curious to see how you handle the mid-twenty-first Century later. Yeah, Spock does say we avoided a war where yellow peril took over the planet, whatever that was supposed to mean. But wrapped around that was discussion after discussion about WWIII which I don’t think could be fought conventionally. I agree Roddenberry was champing at the bit to remind us the STS was named for his ship when those pictures were put up in the rec room, but there they are and we have to deal with them because they don’t necessarily clash with what’s been established, unlike stuff in VOY or ENT which are just blanketed revisionism. In the end Star Trek should really take place in the 22nd century considering more references in TOS than not clearly stated the 20th century was 200 year prior. But the sheer amount of conflict and technical achievement doesn’t add up in a 200 year time frame. That would put WWIII and the Romulan war at the same time period – or, if the Eugenics war is WWIII then an incredible amount of progress from a war torn planet to an interstellar power. All over hard to clump together. I have absolutely no doubt that there was an orbital vehicle named Enterprise. In fact, if we are both of the opinion that TOS (and by extension, TMP) trumps reality, then Enterprise would have not only been the first orbiter constructed for NASA, but it would have also been the first orbiter to conduct manned missions in Earth orbit – a direct departure from our own chain of events. As far as dating TOS goes, I think no one can really dispute the setting of circa 2260 at this point since the episode “Miri” essentially nailed it on the head. I am very pleased to know that you also follow the “TOS trumps reality” line of thinking 😀 Clearly, we are dealing with an alternate universe setting for Star Trek, with 1968 being the latest point of departure between our own ‘line and Star Trek. Not sure why the STS would be the first manned oribiter in Trek. The Apollo missions are mentioned a lot. The first manned moon shot is discussed on the radio in “Tomorrow is Yesterday”. Miri states the objects on the planet are 300 years old. That doesn’t have to mean our 1960s happened at the same time as their 1960s. But the point is moot. I should clarify that I meant that it would be fun to consider the Enterprise as the first operational Orbital vehicle, and that perhaps in the Trek ‘verse, it was actually outfitted for regular orbital operations as opposed to just being a flight test article as it was in our ‘line. Ah, I understand. I should have caught that in your OP.